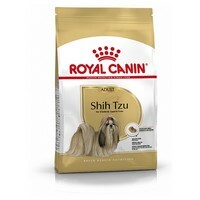 Royal Canin Shih Tzu Adult is a complete feed that has been specially formulated for the adult and mature Shih Tzu breed over 10 months old. Made with high quality ingredients to meet the needs of the breed, Royal Canin Shih Tzu Adult provides optimal support for their unique physiology. Healthy Skin & Coat: Helps support the skin’s “barrier” role (exclusive complex), maintain skin health and nourish the coat. Dental Health: The formula contains calcium chelators to help reduce tartar formation. Stool and Odour Reduction: Helps reduce faecal smell and volume. Exclusive Kibble: Special Brachycephalic Jaw: Exclusively designed to make it easier for the Shih Tzu to pick up and encourages chewing. Rice, Dehydrated Poultry Protein, Animal Fats, Vegetable Protein Isolate*, Hydrolysed Animal Proteins, Vegetable Fibres, Beet Pulp, Minerals, Fish Oil, Soya Oil, Fructo-Oligo-Saccharides, Borage Oil (0.1%),Marigold Extract(Source Of Lutein), Green Tea And Grape Extracts (Source Of Polyphenols),Hydrolysed Crustaceans (Source Of Glucosamine), Hydrolysed Cartilage (Source Of Chondroitin). my shih tzu loves this food and eats it all. I have had no problems with this food and my shih tzi has a sensitive tummy. VetUK prices are excellent.